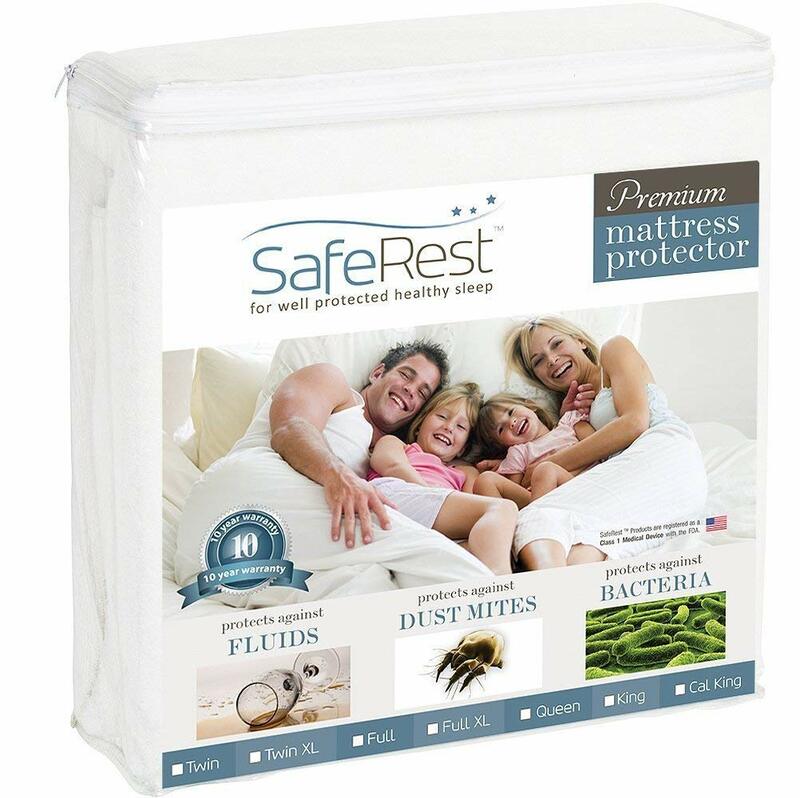 This protector is fitted sheet-style, but an encasement version is also available. This mattress protector is lab-tested and GREENGUARD Gold certified. It’s nontoxic—no PVC, phthalates, or fire retardants. It’s available in sizes from mini crib to California king. There has been some leakage reported in cases of incontinence. This mattress protector is waterproof, but it may not be great for kids who wet the bed. No plastic smell or sound. It’s also breathable through microscopic holes. The sides are not waterproof, so liquid may still seep through. Covered under an excellent 15-year warranty with excellent customer service. 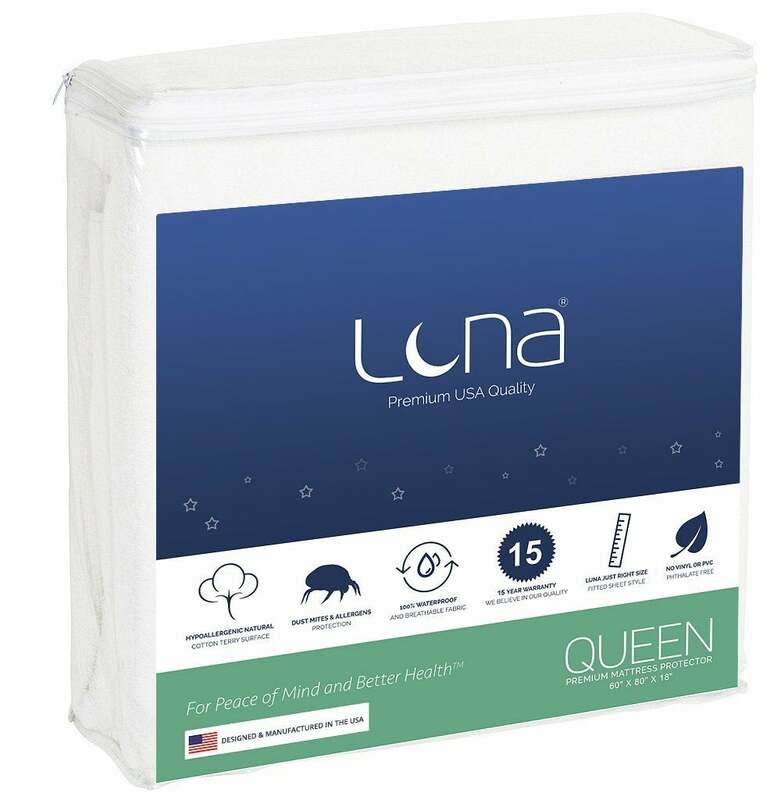 Luna Airflow Technology allows the mattress to still breathe under the protector. No PVC or phthalates. Some customers report of an initial odor, but it should go away after the protector is unpackaged. This mattress protector is registered with the FDA as a Class 1 medical device and is 100% waterproof. It has 18-inch-deep pockets and an Invisa-Shield that shouldn’t change the feel of your mattress. Some crinkles reported and memory foam doesn’t seem to be as unaffected as advertised. A fitted sheet-style mattress protector that’s large enough for memory foam mattresses. It can fit mattresses up to 22 inches deep. It’s breathable enough to use on memory foam mattresses. It’s covered under a 15-year warranty and a pillow protector set is also available at checkout. It’s machine-washable, but hang dry only. Night sweats, spilled wine, bed bugs—oh my. Mattress protectors are anti-allergy, waterproof coverings that preserve your mattress from dust mites, moisture, and more. In our guide below, we outlined different mattress protector styles and materials—with feel and function in mind—plus some tips for banning bed bugs. Taking all of those factors into consideration, we narrowed the best mattress protectors to five, which we’ve highlighted above. Whether you’re potty training your child or your Sunday morning agenda always includes breakfast in bed, a mattress protector can save the day. Protectors are water-resistant covers that surround your mattress in one of two ways, which we’ll discuss below. They shield your mattress from moisture (think: night sweats, urine, coffee dribbles, etc. ), allergens, dust, and pests. Whatever your situation may be, we’ve got you covered with five of the best mattress protectors on the market. Scroll to the top of the page to compare our top mattress protector picks or keep reading below for a comprehensive guide about how to protect your mattress below. Fitted sheet-style protectors are easier to put on your mattress and are usually cheaper. However, dander and dust can still get in through the bottom of the bed with these protectors. Liquids may also seep along the sides to the bottom. Waterproof mattress protectors are made with a plastic-like membrane to wick away moisture. The polyurethane layer is thin, but it may still make a crinkling noise that you’ll have to get used to. You might buy a 100% waterproof mattress protector if you have children, pets, or eat and drink in bed. An encasement protector fits all around your mattress and closes with a zipper. This makes the protector more resistant against allergens. You’ll need help from at least one other person to get this sucker installed correctly. Pros—Cotton is a naturally hypoallergenic material that’s soft but still allows the mattress to air out. Cons—These protectors may be more absorbent than waterproof products and they can be more expensive. Pros—This is an affordable, durable option that traps bugs and allergens. Cons—If you sleep hot, note that this synthetic material isn’t very breathable. Pros—This sustainable material is a breathable option that deodorizes your mattress. Cons—Bamboo mattress protectors are expensive. Pros—Vinyl mattress protectors are super waterproof. Cons—It’s a plastic, so it’s not the cleanest material to rest your head on. Vinyl protectors also tend to make a crinkling noise when you lay on them. Your first step to purchasing a mattress protector is to reflect on the sleeper’s needs. Kids’ and senior’s beds will benefit most from a waterproof mattress protector in the case that they have an accident. 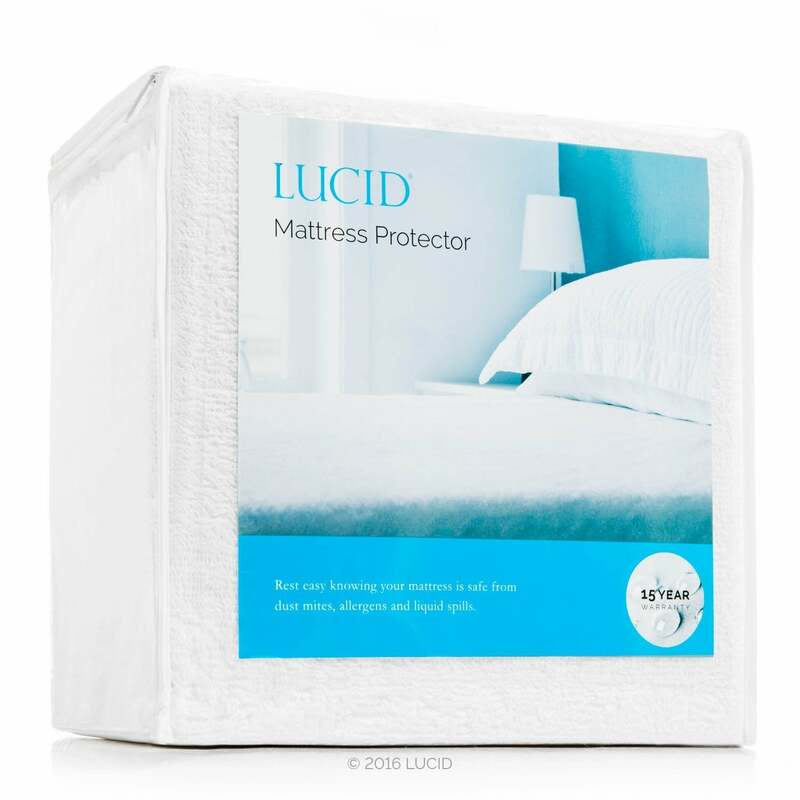 Encasement protectors provide the most protection against bed bugs and dust mites and are therefore the best mattress protectors for apartment dwellers and allergy or asthma sufferers. Fitted protectors will do an OK job at protecting a mattress, as the bottom of the mattress is not protected. If you’re sensitive to sound, stay away from vinyl mattress protectors. They make a crinkling sound every time you toss and turn. If natural materials are important to you, opt for cotton or bamboo. Polyester is a durable choice that you won’t have to replace as often as natural materials, but it’s not an ideal option for those who sleep hot. If your mattress protector is wicking away sweat and spills, you’ll want to regularly wash it. Many bedding experts recommend washing it every two months, but if your child wets the bed or you suffer from night sweats, you might have to wash it more often. Always refer to the care label before washing your mattress protector. Most are machine-washable on a gentle cycle, but some are hang-dry only. Just the thought of bed bugs alone is enough to keep any one of us up at night. Here are some tips for keeping these creepy crawlies away. 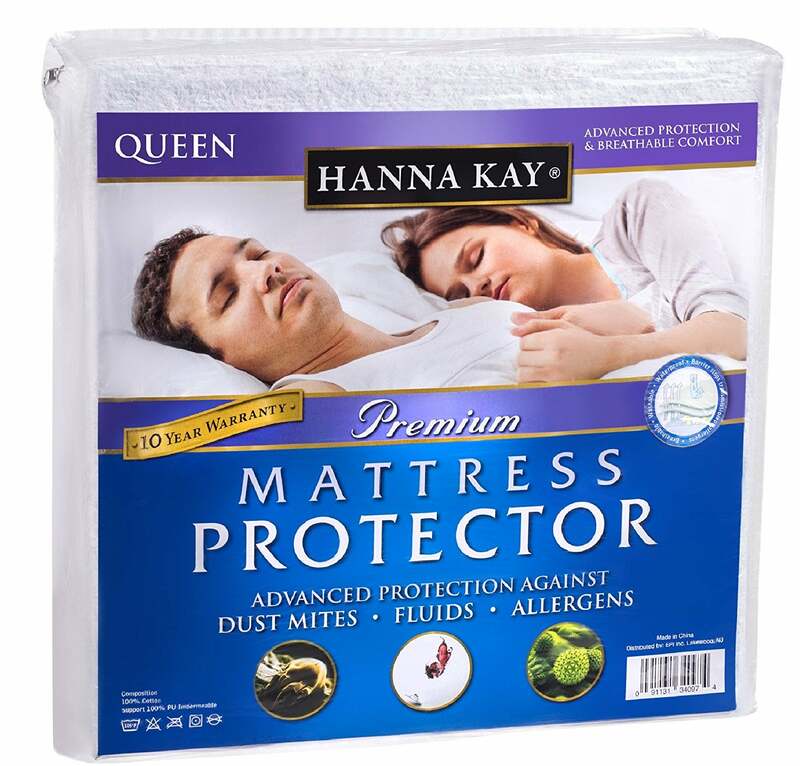 Buy an encasement-style mattress protector. Declutter and dust often. Every nook and cranny, crack and crevice. This is prime real estate for bed bugs. Routinely clean all hard surfaces—nightstands, headboards, dressers, etc. Wash clothes with hot water. Give all second-hand goods a close examination with a flashlight before bringing them home. Doors should have weatherstripping and windows should seal completely. A mattress protector covers your mattress to shield it from liquid, dust, pests, mold, dander, and dandruff. Many mattress protectors are water-resistant to some degree. Waterproof mattress protectors have an ultra-thin polyurethane or vinyl membrane to wick away water. These are helpful in cleaning accidents and preventing stains. What is the best mattress encasement? 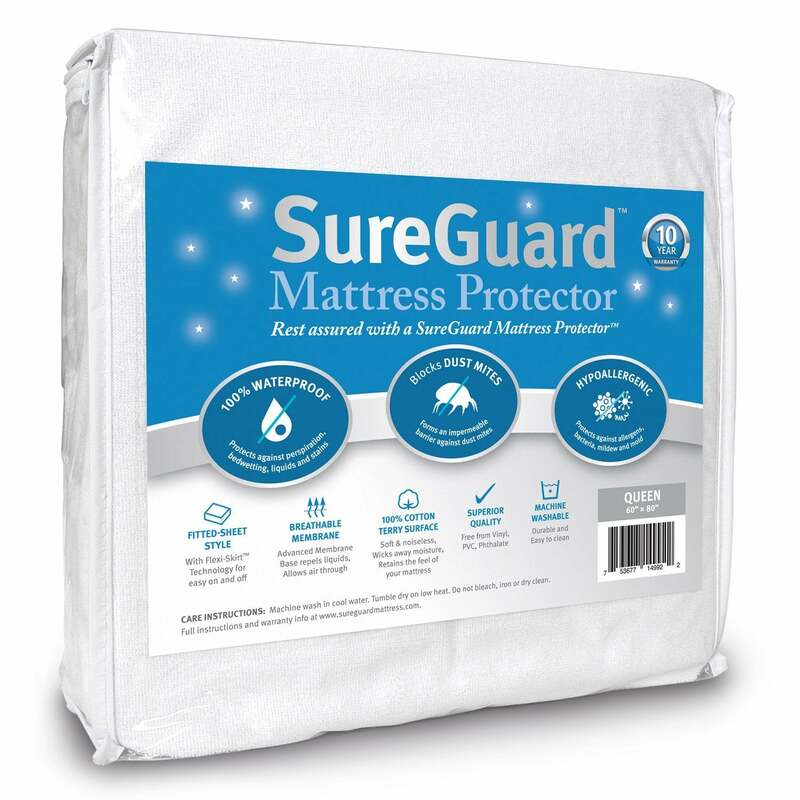 The SureGuard mattress protector is available in an encasement style. We voted its fitted sheet-style counterpart the best mattress protector because it’s water-resistant and made of clean cotton, which is nontoxic. It’s also available in sizes from mini crib to California king so all of your beds are covered. Do you need a mattress protector and a mattress pad? A mattress protector will fit under a mattress pad. A mattress protector is thin and preventative while a mattress pad is soft and adds extra support and cushion to your mattress. Unlike mattress protectors, mattress pads are not waterproof, so we suggest you buy a mattress protector even if you plan on using a mattress pad. Do mattress protectors prevent bed bugs? Mattress protectors prevent bed bugs from getting inside your mattress. An encasement-style mattress protector is your best bet against pests.